4,26 MILLION CARS SOLD IN 2010. 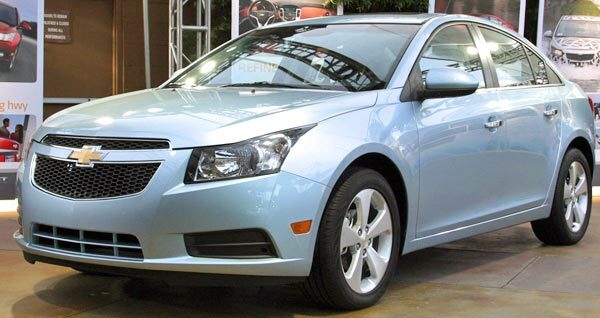 The Cruze has become a key model for the growth of Chevrolet. DETROIT - Chevrolet has sold 4,26 million vehicles worldwide in 2010, it means an average of one car every 7,4 seconds, a fact that gives to the company a result of 5,8% of growth in global sales. Although the U.S. is still the largest market for the brand as sales in the country represent 70% of the total, Chevrolet reported a significant increase in the BRIC countries (Brazil, Russia, India and China), which were responsible for about 33% of the rest of sales. In Brazil, Chevrolet revealed sales of 657,697 units, being the fifth consecutive year of growth, while in Russia, sales reached 116,233 units, being the Chevrolet Niva, the most popular model. The continued growth of the Chevy firm, is in part, because eight of its 10 top markets are emerging economies (Brazil, China, Uzbekistan, Mexico, Russia, India, Argentina and Colombia), and although in Europe they have increased the participation to 21 countries, the GM company is far from becoming one of the best groups. Undoubtedly, the emergence of models in the United States such as the Volt, Cruze and the Silverado pickup as well as the Sail in China, the Viva pickup in Brazil, and the Orlando in Europe, have been essential points to catch new buyers. In the case of the Volt, despite it makes Chevrolet as a technology leader, the Cruze has become a key model for the global growth of the firm, and although it arrived to America in 2010, they expect good numbers for this sedan for the coming years. Meanwhile, Chevrolet showed what were their five best selling vehicles in 2010, which are listed below.